TMED6 (transmembrane emp24 domain-containing protein 6) is a 240 amino acid single-pass type I membrane protein that belongs to the EMP24/GP25L family and contains one GOLD domain. The gene that encodes TMED6 contains around 8,564 bases and maps to human chromosome 16q22.1. Encoding over 900 genes and consisting of approximately 90 million base pairs, chromosome 16 makes up nearly 3% of the human genome and is associated with a variety of genetic disorders. The GAN gene is located on chromosome 16 and, when mutated, may lead to giant axonal neuropathy, a nervous system disorder characterized by increasing malfunction with growth. Alterations in the CREB gene and NOD2 gene, both of which are located on chromosome 16, result in Rubinstein-Taybi syndrome and Crohn's disease, respectively. An association with systemic lupus erythematosis and a number of other autoimmune disorders with the pericentromeric region of chromosome 16 has led to the identification of SLC5A11 as a potential autoimmune modifier. Western Blot analysis of TMED6 expression in transfected 293T cell line (H00146456-T01) by TMED6 MaxPab polyclonal antibody.Lane 1: TMED6 transfected lysate(26.4 KDa).Lane 2: Non-transfected lysate. TMED6 Antibody (Center) (AP54285PU-N) western blot analysis in HL-60 cell line lysates (35 µg/lane). 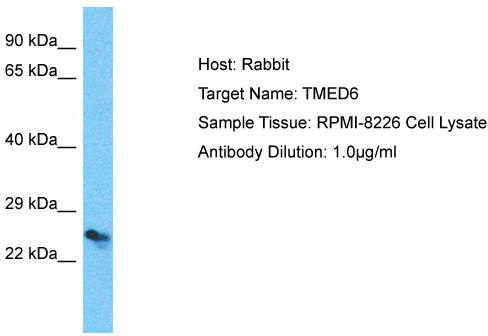 This demonstrates the TMED6 antibody detected the TMED6 protein (arrow).